Joy Creek Photo Archive (c) all rights reserved Cornus sericea 'Hedgerows Gold' is a gift to Northwest gardeners from Oregon's Hedgerows Nursery. 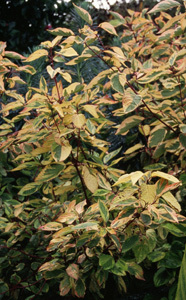 The bright yellow and green variegated foliage drops in November to reveal deep red stems. A Great Plant Picks selection. May to June. 6 ft. x 8 ft.